Age-related changes often first start to occur in the brow, or forehead region. Forehead lines gradually appear and the brow itself droops. For women and men in the Baltimore area, a brow lift performed by board-certified plastic surgeon Dr. Alyson Wells repositions the brow line higher, which reduces the appearance of lines and wrinkles and makes the eyes more prominent. The goal is to gently lift the eyebrows into a natural arc and restore a firmer, youthful appearance to the upper portion of the face while preserving natural function. To speak personally with Dr. Wells about the enhancements of a brow lift, request a consultation online or call (410) 628-8200. Dr. Wells welcomes the opportunity to help you achieve your facial rejuvenation. 3 Are You a Candidate for a Brow Lift? 6.1 What can I expect during recovery after a brow lift? 6.2 My eyes look tired all the time. Will a brow lift help? 6.3 I’m in my 30s and have always been bothered by eyebrow sagging. Am I too young for a brow lift? 6.4 Which type of brow lift is right for me, endoscopic or coronal? How do you decide? 6.5 Do you offer a non-surgical alternative to a brow lift if I’m not ready for surgery? 6.6 How much does a brow lift cost? Repetitive muscle movement creates different wrinkles in various forehead muscles. For a brow lift (or forehead lift), Baltimore-area specialist Dr. Wells uses various techniques to correct these signs of aging. The procedure involves carefully modifying specific muscles to disrupt their normal activity while preserving proper muscle function. This diminishes lines and wrinkles even as your muscles still function to create natural facial expressions. In addition to selectively disrupting muscle activity in the brow region, the brow is lifted to a higher position. Small implants inserted between the tissue and bone, and adhered to the bone, fix the tissues in a higher position. Or sutures can be used to pull the brow upward to give a smoother, more youthful appearance. A brow lift can also correct excess upper eyelid skin at the corners of the eyes (lateral hooding) when blepharoplasty (eyelid lift) is inadequate. As we age, layers of muscle weaken and fat deposits, which normally act as a cushion between skin and underlying bone, are depleted. The eyebrows and forehead descend, often resulting in a tired or angry appearance, along with a heaviness of the upper eyelids. 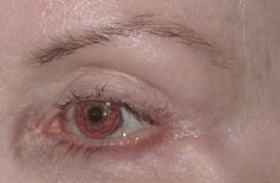 Lines and wrinkles in the brow region become increasingly apparent. A forehead lift reduces the appearance of these lines and lifts the brow, often achieving results that can make you look as much as ten years younger. Please note that you may not be an optimal brow lift candidate if you are bald, have a receding or high hairline or have had prior upper eyelid surgery. In your private consultation, Dr. Wells will determine which procedure is best for you. An endoscopic brow lift is performed through small incisions behind the hairline of the scalp. Using a tiny camera and narrow instruments, the tissues of the forehead are pulled upward and secured with absorbable tacks. Scars will be hidden within the hairline. A coronal brow lift is performed by making an incision that extends from ear to ear over the top of the head approximately 6 to 8 centimeters behind the natural hairline. Frequently, a brow lift is combined with eyelid surgery (blepharoplasty or eyelid lift) to maximally reduce the heavy, sagging appearance of the upper eyelids and drooping eyelashes that impair vision. For greater enhancement of the face, consider combining your brow lift with a neck lift or facelift. What can I expect during recovery after a brow lift? Following your surgery in our accredited surgery center and observation in our post-anesthesia recovery area until you are awake and comfortable, you will return home or to your hotel with a family member or friend. Most patients will have a soft wrap dressing around the forehead, which may extend onto the cheeks and neck because a brow lift is often performed at the same time as a facelift. 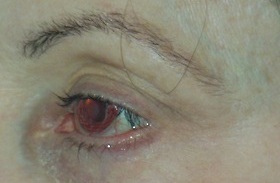 Some swelling and minor bruising are common but resolve quickly. Most patients experience relatively little discomfort but may have a dull headache initially that can be readily treated with pain medicine (and a little caffeine because you had to skip your morning cup of coffee!). The surgical clips used to close the small scalp incisions used for the endoscopic brow lift procedure are removed after approximately 2 weeks. Most patients feel they are able to resume work outside their home within 2 weeks, but strenuous activities are limited until 3 to 4 weeks following your procedure. My eyes look tired all the time. Will a brow lift help? Feeling that your eyes look tired may be the result of several different issues. A brow lift is often one component of the solution. A tired look may be related to excess skin that accumulates at the upper and lower eyelids as we age, dark circles under the eyes, or “bags” under the eyes, in addition to a low position or sagging of the eyebrows. Excess skin of the eyelids and bags under the eyes are usually improved by upper and lower eyelid surgery, while dark circles can be eradicated with fat transfer. Sagging or heaviness of the brows can be corrected with a brow lift, giving you a more awake and bright-eyed look. Frequently, these procedures are combined and customized to address the specific goals of individual patients. I’m in my 30s and have always been bothered by eyebrow sagging. Am I too young for a brow lift? There are many younger patients who have naturally sagging brows since childhood, or who have noticed a more rapid progression of brow descent in their later 20s and 30s. A brow lift in these patients can be beautifully refreshing, without being too overt and obvious. All of the surgical incisions are well-hidden in the hair, and all people will notice is how well-rested and “fresh” you look. Which type of brow lift is right for me, endoscopic or coronal? How do you decide? Dr. Wells is proficient in all types of forehead lifting and will help you choose the technique and approach that is right for you. Most patients are candidates for the less-invasive endoscopic approach, which offers a shorter incision, less chance of hair loss, and less numbness postoperatively. Patients who have particularly heavy and thick forehead tissues, very high hairlines, or very prominent and curved foreheads are usually better candidates for another type of forehead lift, of which a coronal forehead lift is one option. Do you offer a non-surgical alternative to a brow lift if I’m not ready for surgery? Many patients who desire a less-invasive approach are indeed good candidates for BOTOX. When BOTOX is used to relax the muscles that create the “11s” between the eyebrows and the muscles that produce the horizontal wrinkles on the forehead, we frequently see an elevation of the tail of the brows. This effectively opens the eyes wider and lifts the arch of the brow, giving a subtle, but definite, brow lift effect. The fees associated with a brow lift, similar to other cosmetic procedures, depend upon several factors so it is difficult to give an absolute cost. This is especially true for a brow lift, as it is usually combined with other facial procedures. Valley Plastic Surgery is knowledgeable about regional and national trends in costs associated with providing this procedure, including the costs associated with the fixation devices, anesthesia, and the operating room, and we strive to be competitive with plastic surgeons in the Baltimore-Washington area. However, some variability in fees throughout the region may reflect use of cheaper and perhaps less satisfactory methods of brow fixation, less training or experience of the physician performing the procedure if other than a board-certified plastic surgeon, less training of the individual providing the anesthesia if other than a board-certified anesthesiologist, or lack of accreditation of the surgery facility in which the procedure is being performed. In other words, Dr. Wells is a board-certified plastic surgeon and a board-certified otolaryngologist/head and neck surgeon who operates in her own accredited surgery center with a board-certified anesthesiologist providing the anesthesia.